Years ago I realized that the increasing trend towards carrying plastic instead of cash was probably not going to end well for the homeless who depended on small, impulsive donations. 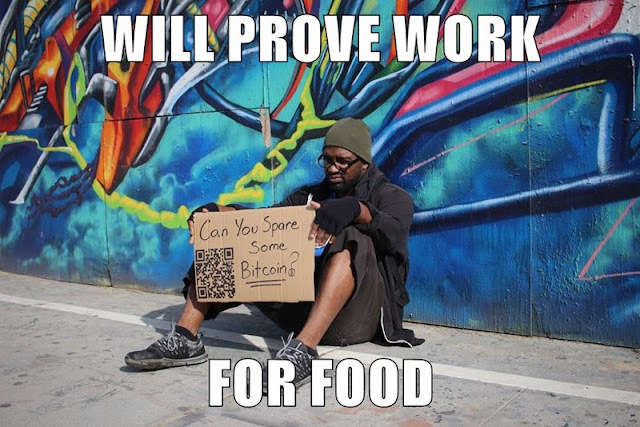 It's not like they accept payment by credit card, but maybe bitcoin and other cryptocurrencies can offer something even cash can't. With bitcoin you don't need to go anywhere near him in order to help out, which should make it even easier because you don't have to overcome any fear of a physical altercation or judgement over the amount given or anything like that. And when I say you don't need to go anywhere near him, I mean in both time and space. Theoretically, if that QR code is readable in this photo, you could help him out right now from the comfort of your home or office. Just one more way in which cryptocurrencies are amazing.